Hackney Council’s Supported Employment Service helps people who live in Hackney and have disabilities and/or health conditions, find work matched to their individual needs and interests. Other partners working on this Supported Internship programme are DFN Project SEARCH and Hackney Learning Trust. 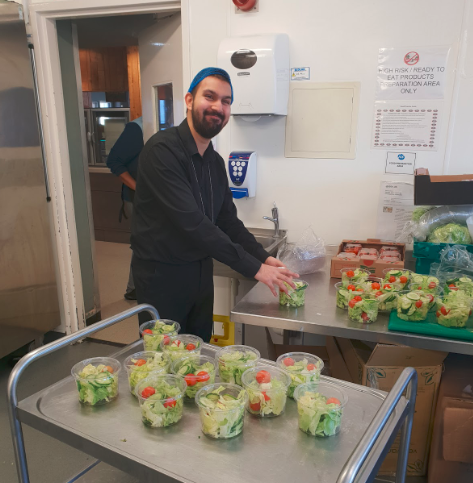 Hackney Council’s Project Search internship programme helps young people with SEND (special educational needs and disability) develop real work skills, in a real work environment. Young people on the programme will be based on site at Homerton Hospital and take part in 3 work placements in different departments throughout the academic year, September – July. When the programme finishes, each intern will work with a Supported Employment Advisor; who will provide further support to make sure they find paid work. How long is the programme and are there different stages to it? This Supported Internship takes place over 10 months September - July. Interns work Monday - Friday, 9am-3:30pm, across an academic year, with breaks for half term. Interns complete a bespoke induction at Homerton Hospital for the first 2 weeks of the programme. Each intern will be undertaking 3 different placements with the purpose of building the necessary skills to be able to get the job they want by the end of the programme. Each young person accepted onto the programme will have a suitable placement arranged for them each term. What work activities will the young people be taking part in? Young people will take part in a variety of activities for example retail, catering, cleaning, patient care and admin. They may be making phone calls, completing filing tasks, cleaning tables, serving food, assisting patients, delivering parcels. What will interns be doing during a typical week? Interns will be completing an employability skills training session for 1 hour in the morning (9am-10am) and then they go to their work placements until 3 pm. At the end of the day a half hour session after the work placement from 3pm – 3:30pm offers an opportunity for interns to feedback or express any feelings or concerns related to the activities they have completed. Do you provide job coaches? Two Job Coaches for this programme are based on site and provide individualised support to the interns on placements. The Job Coaches will support interns learning on placements and within Homerton Hospital on site training room. Is travel training included as part of the course? Travel training is not offered as part of the course but the Job Coaches will be working with parents/carers to ensure that a plan is in place to support the young person to travel to and from the programme. How are these staff trained to provide support to young people with SEND? Project SEARCH delivers training in teaching and job coaching skills to staff on the programme. Training accreditation - Project SEARCH is a model used across the world. Training provided to Job Coaches helps develop the necessary skills for them to be able to deliver coaching, develop placements and work effectively with department managers as well as the interns. What skills will young people be developing on the programme? Project SEARCH interns are not volunteers and complete meaningful work in integrated work settings. Young people on the programme will be developing skills necessary to acquire the job they want. How is progress evaluated for the young person? Each department will be providing feedback twice every term which is then used to set targets for the development of the young person. The job coaches will also be meeting with parents and carers twice every term to discuss the young person’s progress and work collaboratively to ensure success. At the end of the programme are young people supported with finding a permanent placement? Each young person is supported throughout the programme to explore work opportunities. When the programme is completed a Supported Employment Advisor will work with local employers to find the most suitable job for the young person. If the young person doesn’t secure a job at the end of the course they will be helped by the Supported Employment Service to identify a suitable opportunity. Progression or training options after the training are paid employment or an apprenticeship. If you have any questions or need help applying please contact the service by phone. If you have any feedback about the service you received – something you like or are not happy with; then do talk about it with the worker or manager in the service, so that they can try to reslove any problems or look at how they deliver their service.